Past the Shallows is one of those Australian books which becomes an instant classic, spreading by word of mouth and by media alike, propelled along by its sheer perfection until it sits comfortably on the best-seller list. For as long as it has been on the market, people have been telling me that I have to read it. And really, now that I have it seems absurd that I hadn't before. Like Jasper Jones or The Shark Net, this coming-of-age story is quintessentially Australian. It follows three brothers, Harry, Miles and Joe, who live in a fishing town in Tasmania with their father who is an abalone fisherman. Joe does not live at home any more. Every day, Miles goes out on the boat with his father, but Harry gets seasick and so he stays home. As the book progresses, a picture starts to form of a broken home. Years earlier, the boys' mother was killed in a car accident, and their Uncle Nick disappeared. Their father is angry, violent and drinks too much, and his friends and crewmates are no different. For the boys, there is no respite. Their grandfather is dead, and their aunty helps when she can but she is stern and frugal and not much fun. Harry is a happy go lucky child, and in his lone wanderings about the town, he meets a kelpie pup named Jake who lives with the local hermit. At first Harry is afraid of this man because of what the others say about him, but soon he and Harry form a kind of wordless friendship which provides Harry with a safe place to go. Miles, a little older than Harry, tries to protect his younger brother from the evils of their life, but he is only a child himself. In sparing prose, Parrett is able to encompass the fragility of youth as it wars against the hardship of life in this town, and this family. Her characters are vivid and the boys, in particular Harry, are loveable. This book is reminiscent of Tim Winton's Dirt Music, but lacks the hard-boiled cynicism of Winton's attitude to people. Despite everything, the book shows a capacity for hope, and for happiness, and for escape, and it is both heart-warming and heart-breaking all at once. 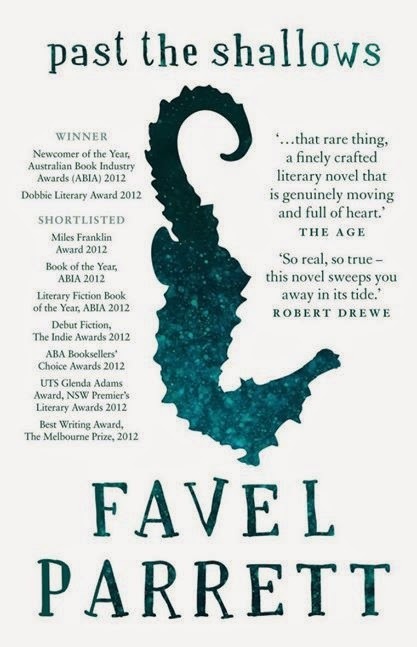 I will be meeting the lovely Favel Parrett when she does a few bookshop events later this month. You can check out her Facebook page for more.